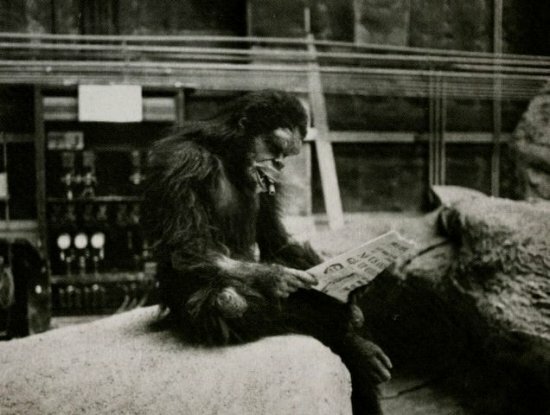 The ape creature from 2001: A Space Odyssey catches up with the morning news. I’ve been feeling bad that I didn’t react more quickly to the passing of science fiction author Arthur C. Clarke. In my teens, he was one third of my literary holy trinity, what I thought of as “ABC”: Asimov, Bradbury and Clarke. I wrote a lengthy high-school essay on what was then my favorite book, Childhood’s End. While I’ve never been fond of the film 2001: A Space Odyssey, I loved the novel and its immediate sequel, 2010. And if there was ever a short-story collection I reread more times than his The Nine Billion Names of God, I can’t think of it. I eventually fell out of touch with Clarke (as well as Asimov and Bradbury) thanks in part to a spate of disappointing follow-ups to Rendezvous with Rama and 2001. When I saw the TV news text crawl about his death, I had a “oh yeah, I’d forgotten he was still alive” moment. That shameful admission out of the way, I want to give the man his due for his part in fueling my youthful interest in the future. And even though we missed traveling to other worlds by 2001 (and, at the rate we’re going, will be lucky to get there by 3001), there’d be a lot fewer people still considering such a voyage without his influence.